Our dog runs have an indoor section and outdoor section. The indoor area is heated in the winter and has air conditioning in the summer. 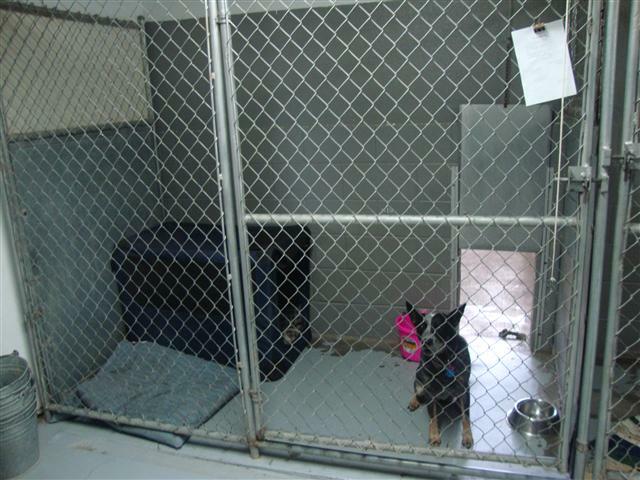 Each dog has a private indoor area of approximately 4’x4’ with a private outdoor area of 6’x4’ with a gate separating the two areas which is closed at night. We do have one extra large run for extra large breeds. We also have two covered runs for those pets who like to jump or females that are in heat. We do allow two dogs to be boarded in one run, but small dogs only. If your dogs love to spend every moment together we'd be happy to board them next to each other or across from each other! Call for more details on sizing and prices. high amount of parvo cases we see in our area. Dr. Burgess recommends you vaccinate annually. Our cats have private multi-level condos. We do provide feed dishes, bedding and litter boxes. You are welcome to bring your own food or we can supply food at no additional cost. You can also bring bedding, toys, and/or scratch posts if you prefer. Please note: 3-year vaccine is not accepted for boarding with us.